This iced golden milk latte is just delicious, plus it's loaded with anti-inflammatory health benefits and ancient healing spices. 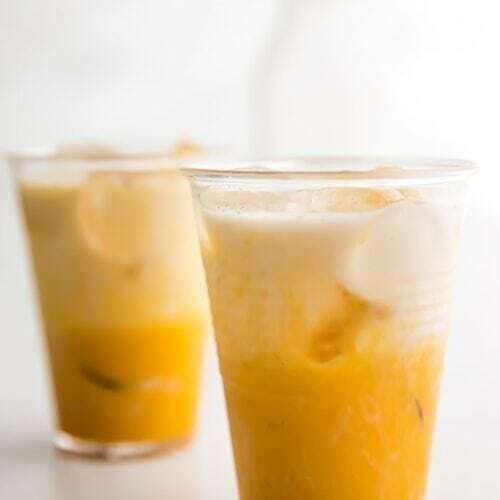 This iced version is refreshing, super easy to make, and comes together in just a few minutes. Great before bed, too. Combine all ingredients in a cocktail shaker. Use 2 cups for a sweeter, more spiced drink; use closer to 3 for a milder version. Shake the mixture well and pour over ice into two serving glasses. If you'd prefer an "ombré" look, like in my photos, first pour half of the milk over ice into two glasses. Then, proceed with the recipe: combine remaining ingredients in a cocktail shaker with ice, shake well, and pour into prepared glasses. If you use coconut milk, make sure it's from the carton. Coconut milk from the can is too thick to use exclusively in this recipe. To make this ahead, simply stir all ingredients together and keep in an airtight container. Shake or whisk vigorously before serving. Pour over ice and enjoy. You can heat this mixture up before chilling to better activate the anti-inflammatory ingredients in the turmeric. I recommend heating it until very warm then letting cool naturally without adding ice. Adding ice will dilute the drink. To make this keto or low carb, simply use a low carb milk of choice (Like unsweetened almond milk) and swap powdered erythritol for the maple syrup. It totals out at 1g net carb. See the nutrition label below.